With its cool sea breeze and fresh sea air you will definitely feel refreshed. Tianjin (tiān jīn 天津) is honored as 'Building Museum' as it was occupied by nine imperial powers before the founding of the new China, leaving behind many buildings with extraordinary and exotic architectural styles. Historical relics, natural scenery, temples, churches, assembly halls and commemorative sites of the Chinese revolution will illuminate Tianjin's past, present and future. Located in the mountainous area of Tianjin's northern Ji County (jì xiàn 蓟县), the Huangyaguan Pass of Great Wall (huáng yá guān zhǎng chéng 黄崖关长城) as first built during the Northern Qi Dynasty (běi qí 北齐). The entire section is built on an abrupt mountain ridge. The major scenic area is composed of Huangyaguan Pass (huáng yá guān zhǎng chéng 黄崖关) and Taiping Mountain Stronghold (tài píng zhài 太平寨). In 1984, the people of Tianjin spent three years repairing 3,308 yards of the main wall. They restored 20 terraces, the Huangya Water Gate (shuǐ guān 水关), and the Bagua Castle (bā guà chéng 八卦城). The defensive system of the wall is complete. Watch towers, frontier cities, drain holes, emplacements, barracks and other indispensable military facilities are arranged orderly along the wall. 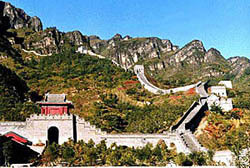 Six miles northwest of Huangyaguan Pass and built 437 yards to 547 yards above sea level, the stronghold is located in Xiaopingan Village (xiǎo píng ān cūn 小平安村). It controls the Chongshan Valley (chóng shān gōu gǔ 崇山沟谷) east of Huangyaguan Pass City. Qi Jiguang's (qī jì guāng 戚继光) stone statue and a tower were erected by twelve widows from this area. Jinmen Guli (jīn mén gù lǐ 津门故里) means old place in Tianjin for the reason that Jinmen is another name for Tianjin and Guli implies old place. Actually Jinmen Guli is a street, Tianjin Ancient Culture Street (gǔ wén huà jiē 古文化街), located in Nankai District (nán kāi qū 南开区) of Tianjin. There are many stores along this street dealing in jade articles, antiques, traditional handicrafts, especially famous Niren Zhang (ní rén zhāng 泥人张) painted sculptures and Weiji (wèi jì 魏记) kites. Covering an area of 224,200 sq meters, it used to be one of earliest water transport docklands in Tianjin. The whole block is still conserved the existing urban pattern and tissue of traditional Chinese layout. Now the new planning and design for the Street had paid more attention to the waterfront and connecting with surrounding around, especially the Old City in the west. The Tianhou Temple (tiān hòu gōng 天后宫) in this area is very famous . In the center is a square and on its western side stands the Palace of the Heavenly Goddess. The temple was built in 1326 and dedicated to Tianhou, the patroness of seafarers. Today it houses an ethnographic collection.On the eastern side of the square, opposite the temple entrance, you can see above the gate the theatrical stage belonging to the temple. Located 12 kilometers northwest of Jixian, which is about 100 kilometers north of Tianjin, Panshan Mountain (pán shān 盘山) is covered with lavish plantations and has a rich historical heritage. More than 320 kinds of trees and shrubs have been found in the vicinity. Its main peak, Moon hanging Peak (guà yuè fēng 挂月峰), although only 864-meters above sea level, rises sharply. Just like other famous mountains in China, the quiet Panshan Mountain is also inhabited by monks. They have been through their fair share of historical troubles and strife: in World War II the Japanese came through this area successfully burning its 70 temples. Today 72 temples of all sizes and Buddhism schools can be found here, both restored and new. 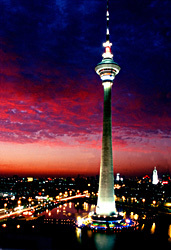 Tianjin TV & Radio Tower (tiān jīn guǎng bō diàn shì tǎ 天津广播电视塔), nicknamed "sky tower (tiān tǎ 天塔)", was built in 1991 and has a height of 415.2 meters. 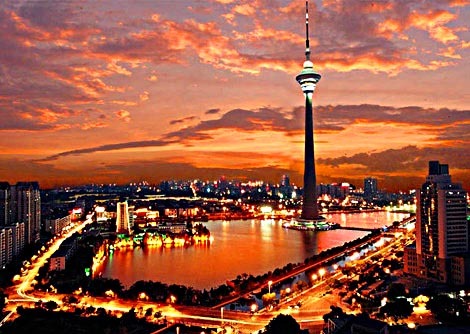 It is the fourth highest TV tower in the world after Toronto TV Tower in Canada, Moscow Tower in Russia, and Oriental Pearl TV Tower in Shanghai, China. Tianjin Tower is located in Hexi District (hé xī qū 河西区) of the southern part of the city. The tower looks like a sword pointing to the sky amidst lakes of shining ripples. Around it is an unobstructed view of land and water with lush vegetation and blossoming flowers. The tower casts its reflection in water. Music adds more glamour to this reassuring serenity. There is a restaurant in the tower at the height of 248 meters to 278 meters which can simultaneously accommodate more than 200 guests and providing a bird's eye view of all Tianjin in this 'hanging restaurant'. Built in 1950, Water Park (shuǐ shàng gōng yuán 水上公园) is located in the southwest of Tianjin. It is the largest scenic park in the city. Surrounded by water are 12 isles, which are also connected by elegantly designed arch bridges and artificial dykes. These bridges and dykes divide the water surface into East Lake, West Lake and South Lake. The central point of the park is Yuantiao Pavilion (tiào yuǎn tíng 眺远亭). Twenty-six meters high, the pavilion is the highest point within the park. Around it is a three-layer sloping terrace, which offers a spectacular view of the park at different heights. 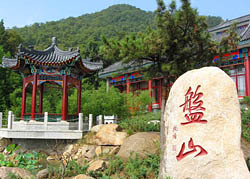 Within the park are also built Shenhu Garden (shén hù yuán 神户园), Penjing Garden (pén jǐng yuán 盆景园), Bibo Village (bì bō zhuāng 碧波庄) and Children's Paradise, all of which are imitations of antiques. A zoo is home to nearly 200 species of animals, including pandas and golden monkeys. 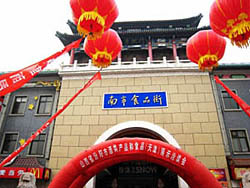 It means the "Nanshi Food Street and Hotel Street (nán shì shí pǐn jiē hé lǚ guǎn jiē 南市食品街和旅馆街)". As a large city, Tianjin can indulge you with almost all eight of the classical Chinese cuisines, of which seven types can be enjoyed in Food Street. 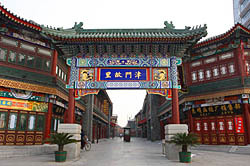 Nanshi Food Street is an ancient building complex 40,000 square meters in area, with more than 100 restaurants. It is a food paradise where you can taste a thousand different types of food and enjoy the interesting cuisine culture. Undoubtedly each cuisine is a feast for your pallet. What's more all the traditional Chinese constructions are also represented in this street making a feast for your eyes as well. Stepping out of Food Street through Xingge Gate (xìng gē mén 兴歌门), its west gate, you will see the Hotel Street with a group of buildings modeled the architectural style of the Qing Dynasty and provide real enjoyment if staying in one of these hotels. The Haihe River (hǎi hé 海河) is regarded as the 'mother river' of Tianjin. People visiting the Haihe River today appreciate its scenic beauty as well as its historical and cultural atmosphere. Regions along the river present beautiful views starting from Sanchakou (sān chà kǒu 三岔口) to Daguangming Bridge (dà guāng míng qiáo 大光明桥). Two groups of bronze sculptures are particularly noticeable. Verdant trees, beautiful blossoms, green lawns, long corridors under ivy-laced frames, fountains, and sculptures decorate the park. Residents prefer to spend their leisure time ambling there. Focusing on cultural traditions and folk customs of Tianjin, the designer endowed the square with a style of solemnity. The high-tech lighting, the causeway pavement and the wooden floor make the square a shining pearl of the Haihe River bank. There is a spectacular colorful fountain in the central area. In addition, in this playground are three luxurious sightseeing ships, and several speed boats offering tours along the Haihe River. Visitors can also enjoy a boat excursion at night. Light from both banks melts into the water and drifts off, like a rainbow. It is located at the north bank of the Haihe River is one of China's cultural relics. In the Qing Dynasty, there was a Wanghailou Tower, a pleasure location for emperors who made trips to their provinces. 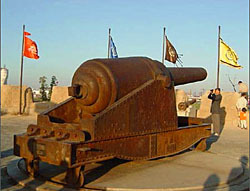 It is recorded as the first rail station in China's ancient commercial ports after the Second Opium War. Together with the establishment of other constructive projects at that time, it is eyewitness to Tianjin's development. Dagu Fort (dà gū pào tái 大沽炮台) standing on the southern bank of the Haihe River (hǎi hé 海河). It is about 60 kilometers away southeast of the Tianjin proper. Formerly there were forts on both sides of the river constructed in the sixteenth century, but in 1901, the one on the northern bank was dismantled. The present one was first constructed in the Ming Dynasty (míng dài 明代) and had a number of renovations in the Qing Period (qīng dài 清代). Today the fort is an attractive site for a day trip to Tianjin, about 60km away from the city proper in a town named Tanggu (táng gū 塘沽). Dule Temple (dú lè sì 独乐寺), also called Great Buddha Temple (dà fó sì 大佛寺), is situated inside the western gate of Jixian County. It was fist built in the Tang Dynasty. 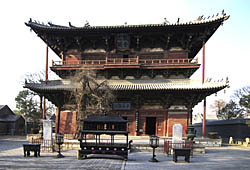 Its main building, the Goddess of Mercy Pavilion (guān yīn gé 观音阁), was rebuilt in A.D. 984. The two-storied wooden pavilion is twenty-three meters high, and so well designed that it has withstood the test of several earthquakes and remains intact to this day. It is one of the oldest and best-preserved tall wooden structures in China. The pavilion contains a standing statue of the Guanyin Bodhisattva with the heads of ten small Buddhas above it. The sixteen-meter-high statue is known as the "Eleven-face Guanyin," one of the largest painted clay sculptures in China. 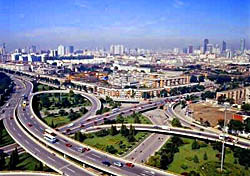 Zhonghuan (zhōng huán xiàn 中环线) is a road encircling the city of Tianjin. The road is lined up with an endless array of modern buildings, parks and small gardens. Lush plants and trees provide a cool pleasant shady canopy. 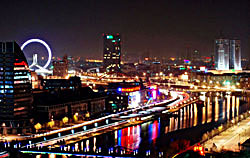 People like to say that Zhonghuanxian is like a colored ring making the city even more enchanting. It is in the north of the Beining Park, hich has nine stories and is 74 meters high. Inside it are paintings for appreciation. But it also offers a good view of the outside. Located to the east of Tianjin North Railway Station, Beining Park was originally built in 1906 for botanical purposes. Drawing upon Chinese traditional garden building techniques, the park features some neatly arranged gardens and pavilions. A library, a theater and a swimming pool are also open to the public. It is located in Hongqiao District (hóng qiáo qū 红桥区). In springs, the sight of the peach blossoms in full bloom and the green shady canopy of willows would attract a lot of literary scholars to come here for poem recitals. Over 800 peaches on the meandering dyke are interspersed with green willows. The park also comprises an undulating and uninterrupted array of architectural structures in classic national styles. 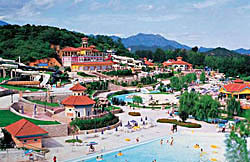 Located in Hexi District in downtown area, the park covers an area of 14.2 hectares. The park comprises rockwork, streamlets, pavilions, pagodas, amusement areas, and animal appreciation sites. Fengting (fēng tíng 枫亭) is in the center of the park and is not an imitation. The park is located in the northwest part of the city. It was built in 1958 and covers an area of 32 hectares. It is dominated by natural landscapes of vigorous trees and plants. The park does not have a long history, but Xigu was already famous for its beautiful scenery in the 19th century. The park is located in Nankai District and covers an area of 34 hectares. Just inside the front gate is a rockwork. Beside the rockwork is a pond surrounded by drooping willows in neat rows. In the west of the park are recreational facilities including a skating rink. Adjacent to it is Fenghua Palace, a complex exclusively conceived for recreation, relaxation and shopping.